Emilie sat across from me, slurping the whipped cream off her hot chocolate like a pink-nosed cat. She asked, "Are those pearls real?" Then she said, "Oh, I really like pearls, but I'm not the dressed-up type." Emilie is in for a shock: there are many pearls that are casual, wearable and lustrous. And in for a deal: I have a special offer to share! 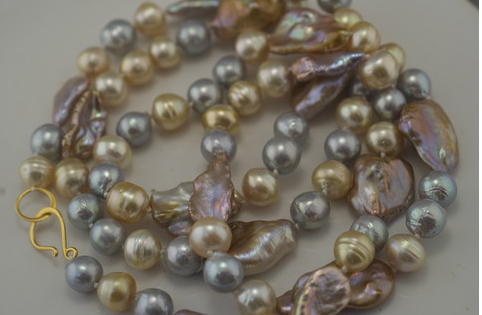 The esteemed pearl expert Sarah Canizzaro of Kojima Company is offering 12% off on any pearls on Kojima's site through January 12, 2012. Use the discount code HAPPYHAPPYPEARLS at checkout and tell us what you chose! Sometimes more is less. A longer length accompanies casual clothes better than short. Though the name reeks of la-di-da, the opera strand is temptress-may-care with a shirt and pants, as shown in this shot of Tilda Swinton in multicoloured Tahitians in "I Am Love". Many women mentioned this strand to me; seeing them worn so offhandedly opened their eyes and they wanted them, as well as those Jil Sander orange pants and the young Italian chef. Girls, I can only do so much. 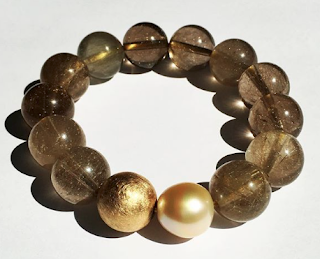 The longest opera-length (which spans from 26 to 36 inches) can double to make a two-strand princess or choker-length necklace; any opera-length piece winds around the wrist for a bracelet. You also won't be wearing as much weight, which you will notice in 60-inch and up lengths. These natural colour freshwater and South Sea baroques (mostly 9mm), accented with big "wing" pearls are a less pricey version of Swinton's clonks. The 36-inch rope is $621 from Kojima Company. If you must have big Tahitians of the finest quality, my deah, add a zero to that pricetag. Ropes (50 to 100, even 120 inches) are enjoying their moment thanks to "Downton Abbey", where heaps of what we know are historic, incandescent Scottish pearls (now nearly extinct) swing to the waist. 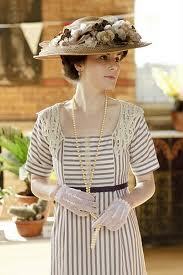 But those who don't dress for dinner will find a rope delights in the garden as well as the salon. You have many options for wearing yours. A page on Kari Pearls' site shows 21 ways; use your imagination and substitute a simple v-neck for the rather bright dress. I chose a 50-inch rope of big pink-peach freshwaters (9.5mm-10mm) for Tash, son Etienne's sweetie, for Christmas. The colour shimmers with her blonde hair, the size is significant enough for her age (late 20's). Perfect with jeans and tall boots or the vintage dresses she collects. 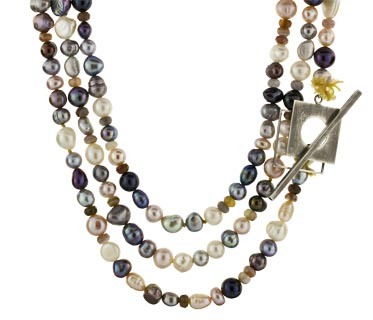 Another take: the 56-inch rope of mixed size (7mm-10mm) freshwater pearls spiked with agate beads and finished with a mod toggle by Beth Orduna at Twist; price, $968. Take this photo to your jeweler if you have a pearl reno project in mind; it's easy to make a variation. The ultimate in casual: a pearl rope with leather. 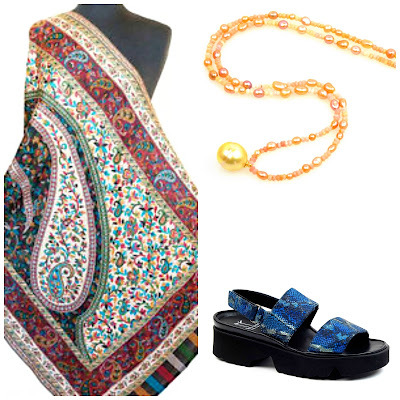 Take yours on vacation to wear with a sarong. American Pearl's St. Bart's rope comes in 55-inch (7 pearls) or 100-inch (14 pearl) sizes. I've shown the freshwaters ($225) but it's made with Tahitian and South Sea pearls, too. Want more pearl to twirl? 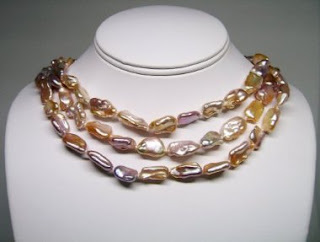 Invest in American Pearl's multicolour Tahitian version, over 100 inches of golden South Seas and grey Tahitians to wind and wear, here and there. Price, $2,500. Ropes of keshis, the freeform, all-nacre pearl loaded with luster, dress down as far as you want, but, unlike a leather piece, will also float up to your party wear. Shown, a multicoloured 64-inch keshi rope; price, $388 from HinsonGayle. Feels good to start the new year with a pearl post! 2012 will be pearly, as more jewelers play with intriguing ways to wear the most graceful of organic gems. I'll keep you pearl-posted. All of these are beautiful! Pearls go with anything, anytime! My mother has a very long rope. Love the looped double look. BTW, on Sunday I posted a pretend outfit for Paris, and, included keshis:). You're starting to convince me...But I have to say, I'm not too fond of multi-colored strands. Remind me too much of what we used to call Indian corn. I would LOVE to think that there were gum ball pearls in my future! I love the lustre of pearls! I have a couple of 60" freshwater strands, as well as a 100". I wear them separately, looped around to 20" lengths. This creates a luminescent collar that bounces light to the face. It's a slightly a dressier look, but I wear it with casual clothes anyway! Your opening sentence was wonderful, it read like the start of a book. I'm the standard white pearl type. Such a fun -- and inspiring -- post! Drool! I'm surprised at how beautifully the pearls work with rope. It's a sparer look but it really draws me in. . .
pseu: Pearls are the perfect way to ring in a new year. LPC: Some multi-coloured strands are the subtlest ecru, pink, gold- reassuringly discreet. hostess: Would love to see a photo sometime of your Mother in her pearls. Could we possibly coax her to pose? SusanG. : More pearls I'd love to see... yes, wear them casually. Tabitha: Thank you; the advantage of whites is that they are eminently wearable. materfamilias: Perhaps I should have shown multiple ropes? You can make long strands as spare or over the top as your neck can handle- see Susan G's comment. Oh how I love your pearl posts! I really like that strand with the leather and the multicolored pearls, I seem to like the multicolored strands more when the pearls are more discretely spaced unless the color variation is much more subtle. I would love an opera length strand of large pearls and I love ropes. I have a 120" strand of 9 mm fresh water pearls which I love and find is best worn casually. I will admit that I sometimes think about shortening it just a bit, to maybe 90 inches and making another necklace with the other pearls. But we will see. I love those Beth Orduna pearls. I need to see if they come in a single rope. Duchesse, I hope that you and yours are having a Happy New Years! What I wouldn't do for a strand of multicolored Tahitians...I'd settle for a princess length if I could get them! I've been remiss in wearing my 45 in strand of naturals I got for a song through an estate...not the most practical when one is house-bound and so, I have time to practice some of those methods shown. I've passed some of my strands and earrings to my 17yo daughter to force myself to wear my antiques regularly. Nothing like encouraging the young to adopt good habits!! Kristi's VIP Salebegins today; use code VPEB11 at checkout for 30% off, is open to everyone tomorrow. I have never had a problem ordering from site; you have to set up your account. All garments have size measurements (width at bust and length); best way is to measure something you already own and compare. Mardel: I know you have some *gorgeous* pearls. Perhaps your new locale will suggest some remodeling? Leather stringing is perfect for warmer locales; you can even swim in them. Gretchen: 45 inches will double nicely, too. What a lovely idea, passing pieces to your daughter. Isn't it intriguing how the same piece looks so different worn by two generations? laurieann" Not sure what you mean by "a single rope". That 56 inch rope can be worn long, knotted, doubled etc.- a really versatile size. 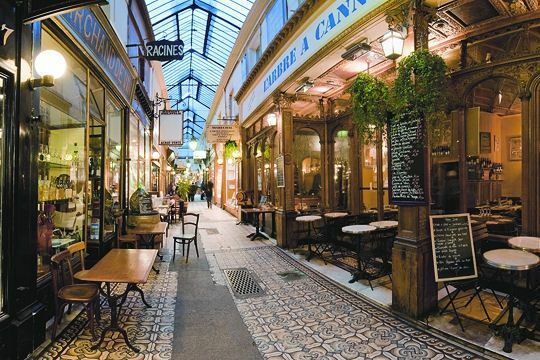 Kristi: Was in a hurry when I wrote the reply to your inquiry above; it is of course Bompard's sale that begins today using the VIP code, VPEB11, and tomorrow for anyone. Why thank you. I guess I asked on the right day! I really, really like the two rope necklaces. I would wear those even though I'm shying away from pearls in general. Like Emilie I'm realizing I'm not the dressed up type. Actually there are many other wonderful gems and materials, I must admit! I bought a leather pearl bracelet on etsy and I'm considering a keshi rope. My jewelry "wardrobe" is nearly complete. thanks for the coupon. Anonymous@ 2:12: I love it when people share their favourite Etsy sites; thank you! Especially admire the Japanese paper tins from Neverstopshoppin'. What a great post - thank for sharing all of your recommendations on pearls. I have a few pieces of pearl jewellery, and would love to find a longer length necklace. They really do light up the face. By the way, I just started following your blog after discovering it through searching for reviews of Eric Bompard cashmere. ( I see there are other bloggers that I follow who are already here!) Thank you for posting the coupon code! !